NASA is planning a number of activities and events in 2009 as America nears the 40th anniversary of the first Moon landing on July 20. The events will celebrate the Apollo program, its accomplishments, and the benefits to our lives today. “Celebrate Apollo: Exploring the Moon, Discovering Earth” is an effort to engage the public and disseminate information about NASA’s historic, current, and future missions. Several items have been developed to aid the celebration, including an Apollo 40th anniversary logo, calendar of events, and website. The site NASA developed specifically for the Apollo 40th anniversary includes the special anniversary logo, an interactive feature about “Moon Trees” grown from seeds that flew on the Apollo 14 mission, and a “First Footprints” toolkit for use throughout the anniversary, which includes downloadable videos, images and events listings. 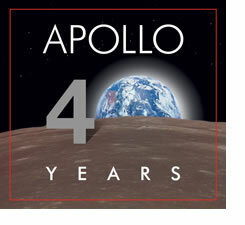 The official Apollo 40th anniversary website is located at www.nasa.gov/apollo40th. NASA’s Apollo missions website provides easy access to various NASA resources and multimedia about the Apollo story, the program, and the history of human spaceflight, including gallery of images from the Apollo program. The Apollo site is online at www.nasa.gov/apollo. NASA also has developed an interactive Apollo program feature. On the anniversary of each Apollo mission, NASA posts a new feature that allows users to relive each mission with video, photos, and a unique animated comic. The feature can be found at www.nasa.gov/externalflash/apollo40. For more information about NASA and agency programs, visit www.nasa.gov.